Today I trekked up the mountain again to Katoomba for another big afternoon of youth ministry training at KYLC. As has been the pattern of my Januaries since 2001, I took the 200 plus first-time delegates through a 90 minute summary of my ‘Dual Action’ material, under the headings of Foundations, Fun, Focus and Fishing. And as always, I found it difficult to squeeze it down to 90 mins…but I came close! It is exciting to know that the content of my material is now starting to stabilise. Although there have been a few tweaks, the heart of the training is very similar to that of last year, and to a large extent, the year before. Hopefully this means I should be able to finally start writing that book on youth ministry in 2007. More training will happen next week with a repeat performance at KYLC, and then down to LiT the next day for more workshops on Youth Ministry. As always, January and February are the biggest months for youth ministry training. Since the start of the year I have delivered training from Katoomba to Nowra, and everywhere in between! In addition, I have spoken at the Youthworks Scripture in Schools Conference at Dapto, plus delivered training in at the annual Salvation Army youth and children’s ministry training conference. Thanks to God for the opportunity to train around 800 people throughout Sydney! 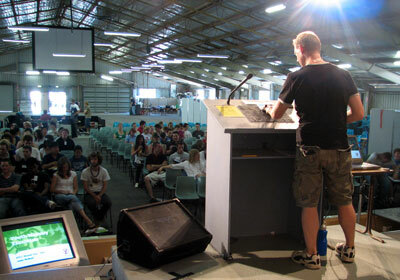 Kyckstart 2005 has raised the standard in evangelical youth conferences. With a combined attendance of over 4000 teenagers, the two weekends provided youth of NSW and the ACT with a great weekend of Bible teaching, music, and fellowship in the gospel of Christ. The theme ‘The Christ Factor’ expressed the main thrust of Philippians, the focus of the six talks. My role over the two weekends was to coordinate the sessions, especially the two evening events. I also MC’d the Saturday night session. The last two weekends of April were a great highlight. I was privileged to be a part of the committee that put together Kyckstart, the annual Katoomba Christian Convention event, attended by nearly 4000 youth. It was a special joy to lead the Saturday night ‘Kycking to the Core’ event. This two-hour event showcased what God has been doing in the lives of many of the youth groups and young people from throughout Sydney and beyond. Some of the stories brought us joy. Others brought us sadness. But in all cases we were able to rejoice that through our sufferings God is producing perseverance, character and hope… which does not disappoint us (Romans 5:3-5).